I know GI Joe was often written at a surprisingly mature level, but expecting kids in 1991 to know about the Persian Immortals may have been asking a little bit too much. The Crimson Guard Immortals are fanatical super soldiers who swear a fearsome oath of absolute obedience to Cobra Commander. A standard "Siegie" (CG), when not serving as a personal bodyguard to the Head Snake, is involved in covert operations around the country under deep cover, assuming an apparently normal occupation and frequently running for public office. The Immortal class forms the upper echelon of these ranks, and also serves as the "guardians of the colors" by displaying and escorting the Crimson guard flag during official Cobra functions. The Crimson Guard Immortals are required to hold a degree in either law or accounting, to ensure that the long-term financial goals of Cobra are being secured. However, they receive further training in mixed martials arts and advanced weapon systems. In order to maintain their exceptionally high standards, they constantly pump iron and are physically more assuming than standard guardsmen. As a ceremonial unit, they wear distinctive helmets and body armor, as well as have access to a secret cache of prototype airburst weapons. This makes them some of the most formidable fighters in the Cobra Legions. When the Crimson Guard Immortals were first released in 1991, they weren't differentiated from the normal Siegies by anything other than their names - as though "Immortal" was just a normal part of the name that we'd all been ignoring until then. This one finally gives an explanation for what sets them apart from the crowd. Well, that and the design. The original CGIs were made unique by the fact that they wore silver body armor over their red uniforms, and this one doesn't change that. The vest comes from Pursuit of Cobra Firefly, and does a nice job of updating the old look. Unfortunately, it's just molded in gray, so it doesn't match the silver painted on the forearm armor (which, like the upper arms and the torso, comes from the Retaliation Cobra Trooper). 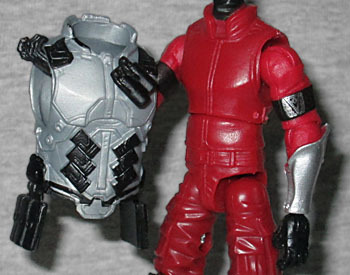 These legs were pigeon-toed when they were hanging off Snake-Eyes' waist, and they still are now. The head is a new Boss Fight Studios sculpt, because no one before was wearing this kind of helmet. It's taller on this toy than on previous releases (judging by the placement of the goggles, there are about three inches of empty space above his head), but at least it's not like the ones released in Europe, which had a G1 Rock-Viper head painted in Crimson Guard colors. 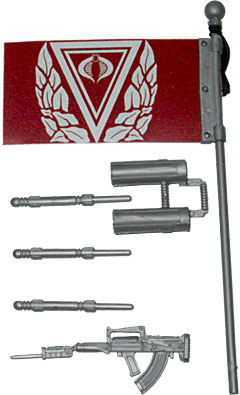 His accessories include an OTs-14-1A-02 Groza with a bayonet on the end, a flagpole with a big red flag bearing the Crimson Guard laurel logo in silver (matching the ones tampographed on his black armbands), and a handheld missile launcher with three missiles - likely the "prototype airburst weapon" mentioned on the filecard. That's an update of one of the weapons the original figure came with, for those keeping track at home. I wasn't expecting much from the Crimson Guard Immortal - I had no fond memories of the 1991 figure, and never really cared much about its design. But having him in-hand, and playing with him, I've got to admit I'm impressed. Part of it is the filecard giving him a reason to be different, but now it's fun to have him with all the other Crimson Guards even though he has a unique look.